Yes, they still make the Scott Classic—and thank goodness. I've been using these since my race days as a kid, and skiing just wouldn't be skiing without them. What drew us to Scott goggles in the first place was fit. Compared to other makers' goggles, the Scotts seemed to better fit narrow faces, allowing less air gaps, better peripheral vision, and more comfort. Scott's anti-fog treated lenses didn't seem to fog as much as other brands, and we especially loved Scott's rose tint, now called the Amplifier lens, which remains my favorite one-size-fits-all lens, good for everything from bright sun to white-out flat light. 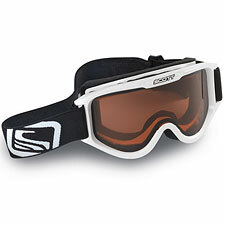 Today, Scott's Classic goggle remains a compelling choice for skiing both inbounds and out. Alpine skiers will continue to enjoy the outstanding fit and comfort of the helmet-compatible Classic, with its soft, hypoallergenic lining foam. The Amplifier lens of course offers 100% UVA/UVB/UVC protection, and does an outstanding job of maintaining definition as you move from sun to shadow. According to Scott, the (patented) Amplifier Lens increases clarity, contrast, and definition via a "sophisticated light transmission process that matches the optimum absorption wavelengths of the eye." No small consideration as well is the Classic's remarkable affordability. In an age of $100+ goggles, you can often find the Classic for less than 30 bucks, making these easily one of the best values in ski goggles, period. Switch to the Classic Alta model for a race-friendly (and lower weight) single lens. The Classic Performance model offers air vents for extra protection against fogging and condensation. For backcountry use, the Scott Classic's impressive low weight make these an easy pick. I measure the double-less Classic at a very reasonable 3.7 ounces. Often times if I'm carrying goggles in the backcountry, they're in my backpack as foul weather insurance. As always, the lighter the gear, the better. And when a storm does blow in, you've got a storm-worthy goggle that will get you through the worst the weather has to offer. The only downside I can think of with these is that they can be hard to find—especially in the off season. Most ski shops' selections are dominated by that other "S" brand, so you may have to snoop around a bit to find a pair.